Portmarnock is the ancestral family estate of the famous Jameson whiskey family. The Jameson’s once had a nine-hole golf course here and the land is now incorporated into the Portmarnock Golf Club and the Portmarnock Hotel and Golf Links. This is the links that Bernhard Langer designed in conjunction with landscape architect Stan Eby and, in 1996, the Golf Links opened for play. The course borders its illustrious neighbour, Portmarnock Golf Club, but the two courses are separately owned and managed. For such a new layout, the Hotel Links is a very natural and understated course. There is nothing showy about the design; the natural links land is used simply and effectively. The first eight holes play across gently-undulating ground with definition provided by varied grasses and pot bunkers. Then, around the turn, a cluster of shaggy sand dunes provides a much more pronounced aspect. We think that Langer and Eby have developed one of the best and most challenging new courses in Ireland; it’s joyous to play a youngster that is so natural and honest. Langer’s comment on his creation was: “There are very few locations in Europe which could have allowed me the opportunity and landscape to design such a classic championship links. I hope all those who play it discover its magic and its challenging beauty.” We thoroughly agree. This is a solid, functional golf course. It has the crisp turf, wispy fescue, some riveted bunker faces, and all the other trappings of a proper links. It gets off to a fairly prosaic start over largely flat ground. They've tried to carve out some movement to the fairways, but it isn't the most interesting of starts. There is a variety to the holes and some interesting greens and tee shots once you get to the back nine, but at the end of the day there is something missing. It lacks the fun of The Island, Laytown & Bettystown, or even Corballis, while also not matching it's grown up neighbour in the seriousness stakes. As a traveling golfer, it's worth a look, but after multiple plays I'm not super keen to return. That said its location does make it a good links option when in Dublin, but I really would choose the others mentioned ahead of it now. It's another 3.5 course for me, but unlike L&B up the coast, I'd put this one down to a 3 instead of up to a 4. Whoever made the decision to piggyback on the name of Portmarnock will not likely make the Hall of Fame for marketing wizardry. A bit of a differentiation would have been better suited. Before delving into the specifics of the course and its related architecture it's important to stress that too many people weigh in on items which have little to do with the qualities of the course. Being warmly greeted when one arrives is a fine gesture but it is absolutely zero to do with the course itself. I am not suggesting that rudeness is welcomed but scoring points from non-golf elements only muddies up the waters. My issue with the layout is that until you arrive at the par-4 8th tee -- the preceding holes are fairly mundane. The terrain for that part of the course is also rather dull. Yet, when you arrive at the 8th things begin to really take off. It helps that the inward holes are closer to the beach area and the land begins to show a good bit more variety. The green sites for the remaining holes are also more stringent on one's approach play than the early part of the course. The par-3 9th and 11th are quality short holes but with any wind can prove quite vexing. The long par-4 12th demands a solid strike off the tee -- linking distance and accuracy. The approach is also testing -- especially to a rear right pin placement. The ebb and flow of the back nine is always about movement - holes sliding one way or the other. Case in point, the par-4 15th hole. The hole dog-legs to the right and players have to decide how much risk do they have the stomach for at the tee. The bold play can set-up a short iron but two deep sand pits await the sloppy play from the tee. The green is nicely angled and again the approach must be hit with precision and executed without doubt. The final trio is a quality finishing stretch. The par-4 16th slides to the right off the tee and has another testing putting surface. When your reach the par-3 17th you likely will turn back into the prevailing wind -- for many that might require a driver if played from the championship tees. The green is another fine target -- elusive to all but the most skilled. The closing hole is memorable in a big time way. Even if one doesn't play from the championship tee I urge all to walk back and check out both the view and challenge that's provided. A left-to-right ball flight can provide big time dividends and for those who feel the urge the daring tee shot down the right side can yield a major reward provided the bunker on that side is avoided. If the pin is cut in the front or back right areas it takes a safe cracker's touch to dial in the right yardage and trajectory on the approach. If the facility were to upgrade the opening series of holes the entire golf experience would reap a major bonanza. Nonetheless, Portmarnock Hotel and Golf Links has enough reasons for anyone in the area to head over and enjoy the round. Clearly, when one takes in the guest fees at other courses in the immediate neighborhood you'll be clearly reaping major savings when heading here. I strongly agree with the central premise of this review - i.e. the actual rating given should reflect the quality of the course only - and perhaps also ignore temporary quality issues (course maintenance like top dressing or hollow tining, etc). There are arguably too many 6 ball ratings because the welcome was very warm or 3 ball ratings because the bacon roll was not quite so warm. The text of any review should still describe all the various other aspects of the “experience”. This is very useful because time and money are limited for many, so when faced with a choice between courses of equal quality, Golfers may wish to have sufficient info to help them opt for the best “experience” - whatever that might be. I always enjoy reading this author's reviews, as I know they come from someone well informed, who is also open about who he is and what he likes. What I like with Top100 is the wide array of opinions displayed. For sure, the architecture is key, but for some it (also) matters a lot if you are treated like sh*t (or having to endure a 5 1/2 hour round in my case) after having chosen to play a highly ranked course and they want to warn others off experiencing the same thing. I am sure most reviewers do their best to see past temporary factors, but it is only by aggregating experiences that patterns emerge: this club is arrogant to (many of ) its visitors, that course has recurring maintenance issues...and you can make an informed choice = the whole point of Top100 in my view. Portmarnock Links Dublin. Not to be confused with its famous near neighbour of the same name which it borders. This links is relatively new, designed by Bernard Langer on the Jameson (of the whiskey fame) estate. Overall a beautiful course and merits the ranking of # 3 in Dublin and # 23 in Ireland. Played it many times and this week off the back tips, which is a challenge for the better golfer. The layout is good winding around the turn with two fine par threes on 9th and 11th holes. There are two blind doglegs- 8th left and 15th right. Each could do with a white marker disk to help the second shot which is commonplace on most Irish Links. The modern links course at the Portmarnock Hotel & Golf Links was the best conditioned of the four courses I played around Dublin last week. The greens were running fast and I was most impressed with the grassy pathways running from many of the tee boxes. As a test of golf I found it a little easier and more forgiving than either The Island or Baltray, which was no bad thing, as I missed my fair share of fairways but found my ball each time. This has to be the perfect base destination for all the Dublin courses, including Baltray, which is a 45-minute drive north. The beauty of staying and playing here at least once is that you can play the course at the weekends when the likes of Old Portmarnock are reserved for members. The Hotel Links is an excellent foil to the old-fashioned layouts, but you’d be hard pressed to guess it’s only twenty years old. Firm and fast fairways went hand in hand with greens that didn’t reveal a single pitch mark, despite my best efforts to make one. I found the course more accommodating scoring-wise than the two aforementioned layouts but it’s by no means a pushover. The wind was light and the sun was shining and apart from one other player, I was the only golfer on the course last Thursday morning. I felt like a millionaire. Naturally, the vast majority of visiting golfers want to play the old classic links courses in the area, but just like its modern counterpart further down the coast at Brittas Bay, do not overlook Portmarnock Hotel as this is the real links deal, which genuinely surprised me… in a good way. Incidentally, I stayed in room 236 and the images show the view from the double-aspect bedroom windows. It doesn’t get much better. As other reviewers have noted, Portmarnock Links features a number of elevated greens, but only one (the 11th) where Langer and Eby have completely removed the ground game from the player’s arsenal. (Though there are bunkers in front of most greens, there’s still room for a well-struck running shot, adding to the strategic challenge.) I think this particularly important in assessing a links course, as I—nd I think this applies to many Americans—did not fly 3000 miles to be forced into the aerial game that is predominates on U.S. courses. There are also occasions—most notably at the 3rd and 5th—where the architects have done a fine job of creating the illusion of a greenside bunker when the hazard is quite short of the green. Doglegs abound, getting one thinking about how much of the corner to cut off. There are sharp doglegs at the 8th and 16th, but the best may be at the 15th with its visually intimidating but playable tee shot. Nicely contoured greens also add to the fun at Portmarnock Links. 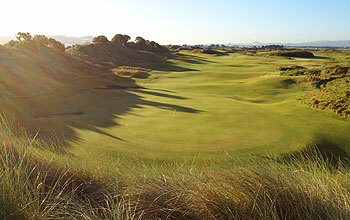 The course takes advantage of the same terrain as its more famous adjoining neighbor—Portmarnock Golf Club. But fame does not always translate into golfing attraction and I think that applies here. I’d as soon play this course as its more famous neighbor. Perhaps the greatest compliment I can pay to this course is that there is no way you could tell this was only 20 years old. It feels utterly natural and without artifice. It is honest, old-fashioned, and most importantly, an excellent and fair test of your golf. Like the Kentish links courses which it reminded me of, it's not going to win awards for the beauty of the surrounding landscape, but there are still a few glimpses of the Irish sea and beautiful beach to keep the aesthetes happy. Cleverly designed, well bunkered, excellent greens and, as others have said before me, outstanding value in an area of Ireland where that is hard to come by. Fantastic value for money at €45, even better that it was not very busy on the two occasions I played (Sunday afternoon + Thursday morning). Unless you need to cross Portmarnock GC off your bucket list, play 4-5 rounds here instead and have change for a great seafood dinner in nearby Howth. Truly great value golf. This is a really solid golf course. An amalgam of this and the "main" course would be a top 5 golf course. N.B they have lengthened the par 5 13th by 60 yards. From the blues it is huge. Great hole of golf. And more back tees for fourteen too. Nice!